A train on the Market-Frankford Line heads toward Center City from 60th Street. 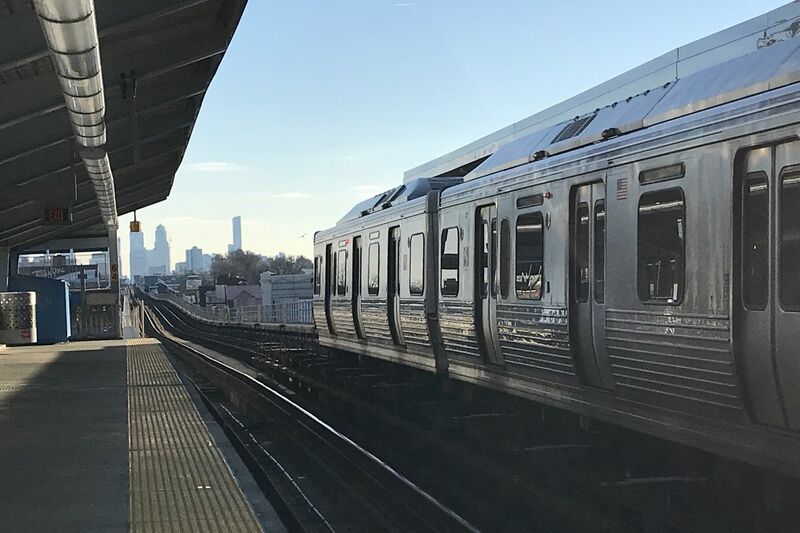 A detailed look at how Philadelphians commute shows investments in infrastructure paying off in some neighborhoods, while others are turning their backs on public transportation that isn’t serving their needs. Cars remain dominant in the city, according to the U.S. Census Bureau’s American Community Survey (ACS) Five-Year Estimate for 2013 through 2017, but significantly more commuters are choosing to bike to work compared with what was shown in the same survey’s results released in 2010. Both the subway and Regional Rail saw increased use, but bus use dropped significantly in the last seven years, which matches trends disclosed by other data released over the last year. The value of the latest data, though, is the detailed look at commuting habits by neighborhood. An Inquirer analysis showed that the number of survey takers who reported commuting by bus declined in most of the city’s 57 neighborhoods. The drop was seen in places both wealthy and poor, and was apparent even in neighborhoods well-served by multiple lines with frequent service, such as Center City and University City. “I think this shows the real need to transform bus service in Philadelphia,” said Chris Puchalsky, director of policy and special initiatives for Philadelphia’s Office of Transportation, Infrastructure and Sustainability. That effort is underway. SEPTA and city officials are in the midst of what is likely to be a two- to three-year project to remake the city’s bus network with more frequent, reliable service. In Oxford Circle, population increased by almost 5,000 and median household income increased slightly, according to SEPTA’s analysis of census data, but public transit use dropped, with 6.5 percent fewer of the community’s commuters reporting using public transit. The unreliability of the bus network was one big reason, a frequent rider said Friday. Jessie Young boards the Route 26 bus at Magee Avenue and Frontenac Street in Oxford Circle. Oxford Circle is an urban car owner’s dream, with ample curbside parking and stately stone-facade rowhouses that often feature parking space and garages accessible from alleys running behind them. But Young noted that SEPTA didn’t make the bus a tempting alternative. She used to work as a certified nursing assistant, she said, and buses at night ran once an hour. She sometimes had to rely on Uber or Lyft to get to and from work. On weekends, she said, service remains so infrequent she is loath to rely on bus service. “Nobody wants to stand on the corner waiting an hour for another bus,” she said. The share of workers who commute by bus fell in 41 of the city's 55 neighborhoods in the last decade, according to newly released census data. Citywide, bus commuting fell by 2 percent from the 2006-10 to 2013-17 five-year periods. By neighborhood, changes ranged from a decrease of 18 percent in Tioga/Nicetown to an increase of 10 percent in Eastwick. Click on the map for more information, including changes in other commuting methods. The census data have some gaps. Most significant, the research doesn’t include a specific category for ride-share companies such as Uber or Lyft, which don’t share their data and, based on a Philadelphia Parking Authority analysis, provided 36 million trips from July 2017 to June 2018. It isn’t clear how many of those riders are commuting by ride share, or how those trips are being tabulated by the census, census officials said Thursday. People taking the survey could be listing a commute by ride share as a car, taxi, or other, officials said. The size of the survey group also means there is a margin of error that can skew results. Overall in Philadelphia, commuting by car has increased slightly from 2010 to 2017, and public transit use has declined by four percentage points, according to the census. Meanwhile, bicycle use showed a surge over the last seven years. About 4,000 more survey respondents said they commuted by bike than reported traveling that way in 2010′s results. Commuters who reported getting to work by bike increased from 1.8 percent to 2.6 percent since 2010. Neighborhoods in South Philadelphia, Point Breeze, and West Philadelphia saw big percentage increases in biking, but the single largest increase in biking was from people commuting from the Parkland neighborhood, where there was a 7 percent increase in cycling commuters since 2010. LoBasso attributes that to infrastructure investments on the Wissahickon Trail and the Kelly Drive Trail. SEPTA, too, attributes earlier infrastructure investments for positive ridership now on the El. The transit agency has for years noted the two subway lines are economic drivers in the city and point specifically to investment in Northern Liberties, Fishtown, and Kensington as evidence of the El’s transformative power. Citywide, the subway had the greatest growth in the share of commuters who described it as their primary means of getting to work. The latest census data show the West Philadelphia and Cobbs Creek neighborhoods as having the largest growth in subway riders citywide, something SEPTA attributes to investments made in the 2000s to the west end of the tracks. “You are starting to see dividends of completely rebuilding the El on the west side,” said Erik Johanson, SEPTA’s director of business innovation. On the 60th Street Station platform Friday morning, riders heading toward Center City said the subway was by far the easiest way to get to work. Despite the value of rail, commuting by car still outpaced public transit options. Close to 40 percent of the city’s workers leave Philadelphia to get to their jobs. As a share of all commuters, slightly fewer reported driving to work in 2017 than in 2010, but in raw numbers as the city has grown, driving has increased with it. Northern Liberties and Fishtown, which grew by more than 4,000 people in the last seven years, added about 2,000 car commuters in that time, and 546 subway riders. Johanson, though, doesn’t see the divide between drivers and riders as a zero-sum situation and says many of those car commuters are still likely using public transit.